There are a good number of festivals in Belgium that function around emerging artistic practices, among them being Almost Cinema, Artefact, Courtisane, City Sonics, Happy New Ears, Jonctions, Transnumériques, VIA and lastly Cimatics, whose fifth edition was held over three evenings last November at Beursschouwburg in Brussels. So what was there to do during the day if not meet the main actors in a digital scene that is in full effervescence? Knowing that it is good to generate a little frustration, Bram Crevits and Nicolas Wierinck, the principal organisers of the Cimatics Festival have conceived two distinct programmes that play simultaneously in two different spaces. One is like a theatre where the sitting position is ideal for attending concerts or live cinema screenings. The other is like a Club where the VJs and other DJs enjoy the proximity of a public that is free to move around. 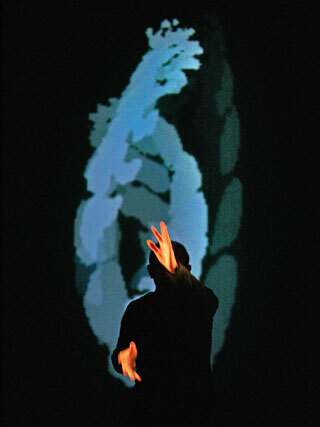 It is in the theatre that the members of Transforma, the Berlin video artists collective perform “Synken” (which also exists in the form of a DVD video), an audiovisual performance accompanied by the electronic music composer Chris Douglas, alias O.S.T. Together, they set up a universe of relative complexity where images and sounds are comprised of a multitude of layers that intermingle, the one with the other. There is the world on top with its forest and the multi-levelled world below, all in concrete. There are strange creatures, one of which is made up of an assemblage of plastic tubes, while another is covered with a sort of fur. There are also a few recurring objects such as a crystal chandelier, which with the changes in light, metamorphoses into a twinkling micro galaxy of stars. And then there is a man, whose eyes we never see, who wanders from one world to another. It is undoubtedly he who holds the keys to this tale without dialogue, of which there are as many interpretations as there are people in the room. 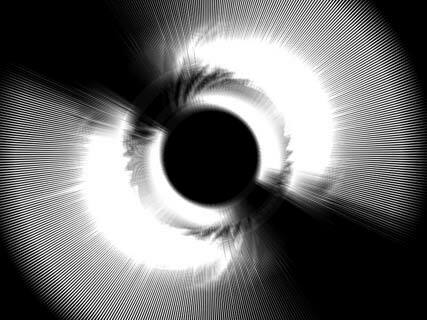 The principal quality of the Cimatics Festival is the diversity of its artistic propositions, but if there is a transversal issue to the new forms of cinema described as “experimental”, whether Live or Expanded, it resides in the relationship between image and sound, and Ryoichi Kurokawa is no exception. 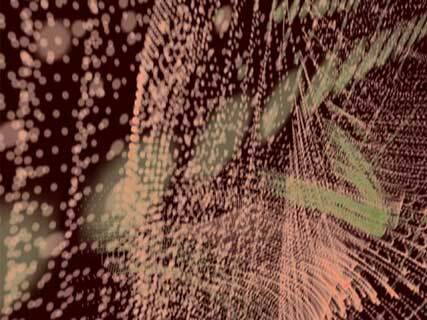 There is in fact no movement in the image being projected, other than sonorous resonance. So one asks oneself at times if it is the sound that “perturbs” the image or the image that produces the sound during its performance. But it doesn’t really matter. Several universes succeed one another and the real, at times, disappears to be replaced by worlds that have been entirely calculated by machines where wire-frame forms of rare elegance evolve within an empty space. And when it reappears, the real seems enslaved by the jerky rhythms of repetitive electronic music. These round trips from the photographic to the abstract are not without surprise, but make up one of the specificities inherent in the Japanese artist’s research. The Austrian artists Billy Roisz and dieb13 have freed themselves from the real and the title of their performance, “NotTheSameColor”, evokes the relativity of the control they have over images as well as the sounds they generate by inter-connecting cameras, monitors, record players and other synthesizers. Their favourite material is none other than noise; noise in images, noise in sound, the noise we ordinarily flee from, the noise that is characteristic of the between; between two television sets or between two radios. And it is the same forces, the same energies that generate images and sounds by partially escaping the control of the two performers. Forces or energies of mysterious origin that Nam June Paik was already tracking in the 1960’s by mistreating television sets in subjecting them to electromagnetic fields. 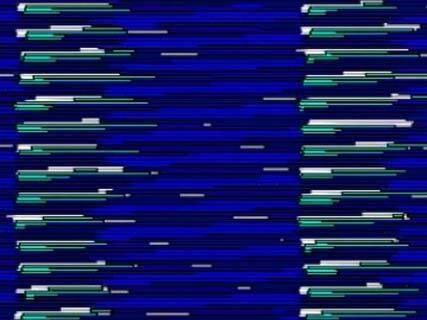 There is in fact something strange, something hypnotic in the incessant flux of vertical sweeps that succeed one another at thirty images a second according to the NTSC video standard; sweeps that are truly never “the same colour”. Lets go down a floor now to go to the “AV Club” where the festival organisers have given Marco Mancuso Carte blanche for an evening. Mancuso is the founder of the Italian Digicult project devoted to digital culture. 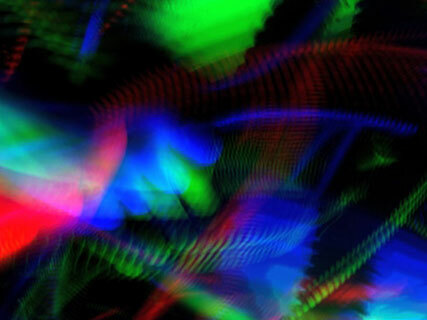 He presents several audiovisual performances under the same name, entitled: “+39:Call for Italy”. Performances of the “Path to Abstraction” from Quayola to “op7” and on to “Otolab” follow one another and have several points in common. Quayola, is a single person while Otolab is a collective, but all share an equal interest in electronic music. There is a question in these performances of the representation of incessant flux. 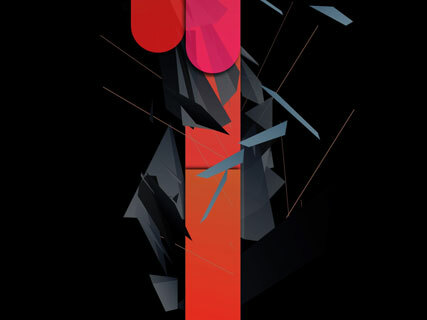 During “Path to Abstraction”, all the graphic elements that appear based on the rhythm of sounds, before disappearing, evolve around the invisible vertical line that divides the projection space in two. And during forty minutes, it is a multitude of two-dimensional coloured primitives that jostle each other on the screen, thus participating in the composition of the abstract paintings that shoot out of the blackness before disintegrating into oblivion. The members of Otolab have also opted for a black background and we are hardly surprised to learn in moving forward through the endless tunnel they give us to explore for forty minutes, that architects belong to the collective. On the three large screens of the AV Club, it is now white, monumental architectural forms that succeed one another, they too subservient to the incessant flux of sonorous events. In immersing oneself in this space perspective without beginning or end, one inevitably recalls the Italian tradition that consisted of materialising space through architecture, of Brunelleschi or of Piero Della Francesca who used numbers like the VJs of today use code. The use of computer code in art shares in the issues developed by a growing number of Belgian structures including the CeCN, Constant, FoAM, iMAL, Le Manège, Nadine, Okno, Transcultures, VJ10, The Vooruit and Mediaruimte, which is located a few steps from Beursschouwburg. This gallery is a little exceptional as it only opens at night and is run by an artist collective called LAb[au]. They specialise in MetaDesign, which they define as: “the setting of codes / language drawn from concepts of communication and information sciences - cognitive science with that of process methods, design and spatial constructs - architecture in the general cultural paradigm and in the production and conception of signforms”. Many people from Brussels do not know LAb[au] even though they have, for the most part, been witness to their actions within the urban space, notably with the celebrated Dexia Tower. This is one of the tallest towers in the city and 4,200 of its windows have been equipped with red, green and blue electro-luminescent diodes. 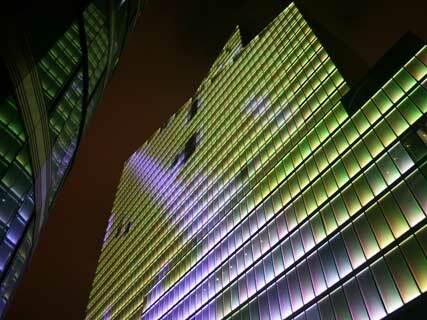 In 2006, LAb[au] transformed it into an interactive urban installation, enabling the public to interact with the colours of its pixel windows with a tactile screen table. Through this action entitled “Touch +/- 0”, the Brussels collective offered “control” of an entire quarter to the inhabitants of Brussels since the reflecting materials of the surrounding architecture also reacted to the public’s desires through a simple phenomenon of contamination. More recently LAb[au] started a series of variations entitled “Who’s afraid of Red, Green and Blue?” in reference to the earlier research of the American artist Barnett Newman. The colours of the tower during the first opus, translated passing time; the hours becoming red, the minutes green and the seconds blue, while more recently also informing us of the weather for tomorrow. 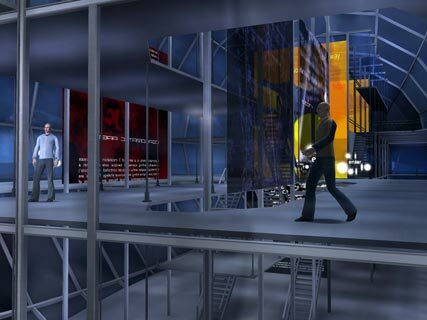 As for the next variations that will augment the architecture of the Dexia Tower with other information, they are still in gestation at the Mediaruimte “laboratory”. The collaborative work methods inherent in the cooperative model of the collective is particularly suitable for artists using digital technologies and medias who thus associate their skills within groups like Code 31, MéTAmorphoZ, Transitscape or Workspace Unlimited. This latter is located in Ghent and was founded by the multimedia artist Thomas Soetens and the architect Kora Van Den Bulcke. They have worked together since 2002 on the creation of a virtual world entitled “Virtual World of Art” that they have built in successive stages according to their interventions in art and research centres like SAT in Montreal, the V2 in Rotterdam or the Vooruit in Ghent. A new entry corresponds with each of these places, a new passage going from real space to its partial reconstitution via the motor of the game Quake. The ground floor of the SAT has thus been virtually reconstituted, but all one needs to do is take the elevator to explore a more imaginative world where one notably discovers interactive 3D installations conceived earlier by the two artists. The second entry of the project, called “Devmap”, is a database that one explores in three dimensions and that brings together a multitude of information relative to the 2004 edition of the DEAF festival organised by V2. Lastly, the most recent extension has enabled the artists and researchers located in Montreal, Rotterdam or in Vooruit in Ghent to communicate together within the same virtual space. Still in Ghent, one needs only cross a few canals to go to the Workspace Unlimited workshop and the development studio of the Tale of Tales games founded by Net artists Auriea Harvey and Michaël Samyn who are at the origin of the “The Endless Forest” project. This involves an application that can be downloaded for free, launches like a screen-saver and is controlled like a three-dimensional video game. So an endless forest emerges from the computer as soon as it goes into sleep mode. The screen takes on the allure of an Arnold Bocklin landscape where a deer with a human face is incarnated that resembles somewhat the deer god in “Princess Mononoke”. It too remains stationary but starts walking or running depending on the buttons that are activated. 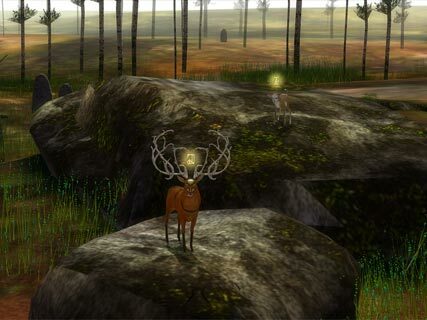 It is not alone because it is surrounded by other animals and can communicate via a few positions with its fellow creatures, which are in fact the avatars of Internet surfers who are connected to the site. It is indeed a game, but without rules or quest. It is an online application that authorises exchanges as long as they do without language. It is a persistent universe in three dimensions where Linden Dollars have no value. In short, it is a pacified world where we hear the sounds of nature, the wind, the water and the birds. But some pretty strange things happen when the two artists who conceived it intervene by incarnating ”Twin Gods” during the performances they describe as “Abiogenesis”, a term that evokes the origins of the living in Greek. Beware of the pond! We know that digital technology and media also participate in the decompartmentalisation of artistic practices. So a few Belgian choreographers and composers following the example of Michèle Noiret, Todor Todoroff and Thierry De Mey, have grabbed hold of sensing devices to invent new forms of theatrical writing. And here it’s the body, augmented by machines, that makes a link between the image or the light and the sound as in Thierry De Mey’s performance “Light Music” whose title tells us that it “authorises a play on words around the idea of “light music” because the instrumentalist has no "instrument". The instrumentalist is Jean Geoffroy who, situated in the centre of the stage in the dark, sculpts the sounds that we perceive and controls the ephemeral traces that are projected behind him by moving his hands into a zone of light in front of him. These multiple layers literally become one with Jean Geoffroy who extracts sounds with his hands and whose movements are converted into as many luminous traces. 2007, © Strange Milena - Sofam. Ingrid Simon comes from the world of cinema, Sébastien Monnoye from multimedia, and they too question the relationship between the body and the image via light with a performance called “Drifting Floor”, where two dancers cohabit within a stage that has been reduced to a few square metres. They are entirely dressed in white, which turns into a screen as soon as they penetrate the receiving zone. Through a system of real time masking, the projected images literally dress the bodies of the two dancers so that we only see their silhouettes. 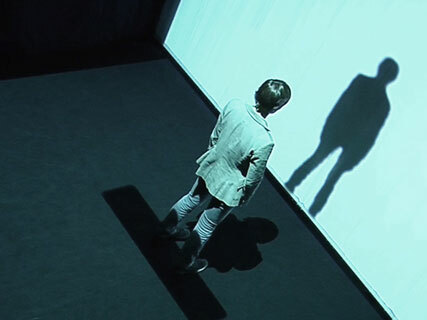 A game is initiated that is expressed around the meeting of these two silhouettes that reveal the projected images and in their shifting, evoke the kinds of animal species that through imitation, camouflage themselves with their environments. And then there is this particularly strange moment when the silhouettes leave the immobile bodies to replay the gestures of an immediate past. …There are still many other artists on the Belgian digital scene like Nicolas Dufrane, Pierre Philipe Hofmann, Bernard Lepercq, Thomas Israël, Olivier Vanderaa and Walter Verdin. Lastly, we should cite the installation conceived by Tom Heene and Yacine Sebti called “Salt Lake”. It involves an immersive device that one explores alone and that was included in Eva de Groote’s programming during the “Almost Cinema Festival” 2007. What could be better than listening to the commentaries of those who have lived the experience along with the videos selected by Yves Bernard, the director of iMal, by visiting imal.org? This new 600m2 space in Brussels is entirely devoted to artistic, scientific and industrial innovations. To think that the Gare du Nord and Midi train stations are only an hour and 22 minutes distant.